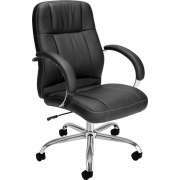 What are the best chairs for back pain? 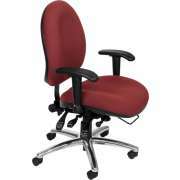 Our computer chairs are designed to promote healthy positioning and create attractive spaces. Everyone deserves proper support, no matter where they are. 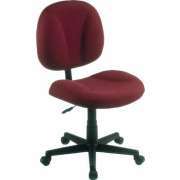 With Hertz Furniture&apos;s wide selection of chairs, you can ensure that all students and professionals are accommodated. 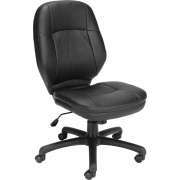 It is easier to maintain a high standard of productivity when seated comfortably. In the process of selecting executive chairs and office chairs, attention should be paid to materials, style and special features. No matter what your practical and aesthetic concerns are, you are sure to find a number of great choices from Hertz Furniture. 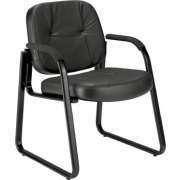 Do students need ergonomic school chairs? In the educational environment, it is particularly important to provide children with ergonomic classroom seating because this arrangement enables them to learn how to write and sit properly. 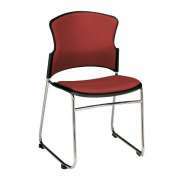 Our student chairs are designed to be supportive for students and appealing in your learning space. We have classroom chairs with hard plastic or polypropylene seats that are contoured to promote natural, healthy positioning. Where can I get colorful chairs? 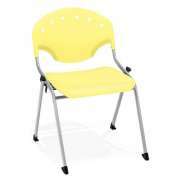 Hertz Furniture has lots of colored student chairs to choose from. 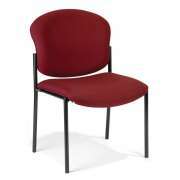 School chairs can be used to integrate new classroom colors or coordinate with other furniture. They come in a wide variety of shades so you can match virtually any hue. You can order a full room&apos;s worth of matching furniture, or a variety of options to add some diversity to the space. Educational Edge wooden preschool chairs offer a winning combination of vibrant tones and attractive, sturdy natural wood. 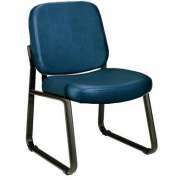 The right school chairs must be appropriately-sized for the students in the class. 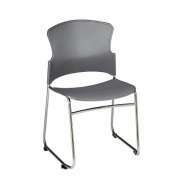 We have chairs in every seat height you might need from preschool to high school and beyond. As an added convenience, many chairs have the option of an attached book basket underneath the seat where notebooks, textbooks and other class materials can be stored. This position keeps everything accessible without creating a distraction. While the general studies classroom is the home base for students throughout the day, there are other rooms where appropriate seating is required as well. Many student science labs and art rooms have counter-height tables and workstations, so they require special seating which enables people to reach work surfaces comfortably. 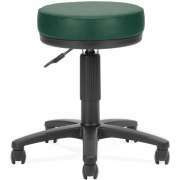 Lab stools and art stools are designed to enable students to work from a comfortable position. Whether they are creating a masterpiece or conducting experiments, they are sure to benefit from proper support. Which chairs will look nice and fit in my storage closet? When congregants come to attend a service or special event, they will want to focus on the content rather than their physical surroundings. Stacking chairs can serve as cushy banquet chairs or church chairs so members and guests can enjoy ample padding as they worship or listen to a sermon. 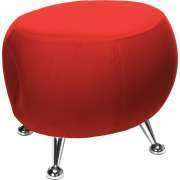 They come in a huge selection of colors and upholstery patterns which will match virtually any space or style. If you are using stacking chairs as church chairs, it is a good idea to order a model that includes ganging devices. Ganging makes it easy to create long straight rows which are ideal for services and ceremonies. When you are hosting an awards dinner or formal banquet in the social hall, stack chairs can be adorned with our elegant chair covers for an upscale appeal that is worthy of the occasion. Visitors, employees and clients will have a much nicer experience with your company when they enjoy proper seating in your work space. Every part of an office needs great seating including the reception room, executive offices and training rooms. 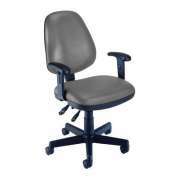 With a wide range of guest chairs, office chairs and training room chairs, the furniture for each space in your office can be selected carefully according to your personal requirements. 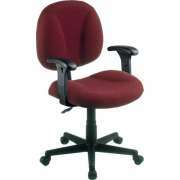 Knowing how to choose an ergonomic office chair is the first step toward a lifetime of pain-free productivity. Hard-working executives and entry-level workers who spend many hours working at a desk need proper ergonomic support in order to make it through the day. Improper seating can lead to pain, discomfort and even medical problems that will eventually cause an employee to miss work and be less productive. Modern ergonomic office chairs come with a host of adjustable features that enable each person to create a custom fit for optimal positioning. Working at a desktop for many hours can lead to specific physical challenges and pain when one is not positioned properly. 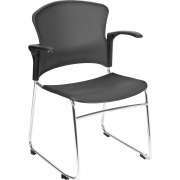 Our mesh back computer chairs provide healthy ventilation with personalized adjustments for height, seat angle and tilt-tension control. These supportive features work in conjunction with our sleek modern designs to bring you digital-era seating that is equally suited to a startup or well-established legal firm. 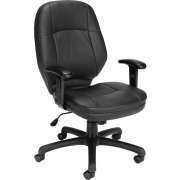 Should I get a traditional executive chair? For those who prefer the classic touches of traditional design, we offer great choices as well. 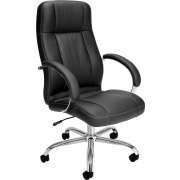 Luxurious leather office chairs will make any executive look and feel like a high-class professional. Our models come from reliable manufacturers including High Point and Better Built Quality. You can enjoy the winning combination of durable builds and classic features including vinyl upholstery that is tufted with individual, hand-driven brass nails, complemented by a deep wood base. Partners and vice presidents aren&apos;t the only people who need a place to sit in the executive office. If the company president or school principal has a large personal office, chances are that this space is often used for meetings, interviews and consulting sessions. When a guest or client comes into this personal workspace, they also need a place to sit. With some cozy guest chairs, everyone can feel comfortable. Guest chairs can be selected to match wood hues of other furniture in the space, or complement wall colors. Many companies host professional-development days and training sessions for current and incoming employees. 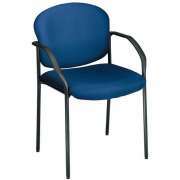 Training room chairs ensure that there is proper furniture for all of your seminars. For your convenience, models are available with casters for easy positioning and folding capabilities for compact nesting. This gives temporary seating the feel of permanence. Should I get waiting room chairs? First impressions can make or break a deal. 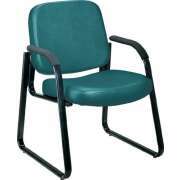 With attractive reception chairs, you can ensure that everyone who enters your work space, school or house of worship is properly impressed. From cozy club chairs to traditional captains chairs, all will appreciate the seamless integration of supportive padding, attractive upholstery and stately wood finishes. 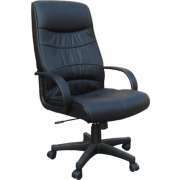 At Hertz Furniture, we understand the value of a comfortable and attractive chair. No matter which room you are furnishing or which style you aim to project, you can find excellent seating options in our collection. With the right office chairs, school chairs or church chairs, your institution will become a fast favorite that stands out from the competition.